One of their best but overlooked was-don't cry..a sad tale of a young man going off to war,any opinions? Love It! 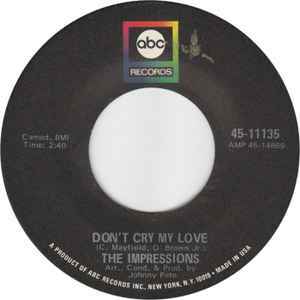 The Impressions' "Don't Cry My Love" is a fantastic performance by the group, one of the most overlooked Vietnam-Era songs concerning men going off to war and leaving their loved ones behind (also a few of the lyrics of the song touch on the injustices of our country's involvement in this particular war). arr&bee, lovely record about going away and separation....... here's an equally lovely one about homecoming and reunion!